Facilitator: Asian Future section is a competition program that the new and talented Asian directors compete. The films from the members of new directors are screened daily at our festival. 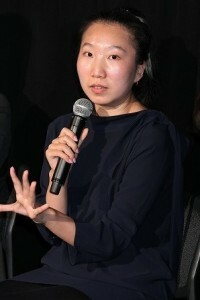 The film was directed by the young female from Inner Mongolia in China. Unfortunately, the director is not here with us today due to the childbearing but the class mate in the film academy and the Line Producer of this film, Zhao Yanming is here with us today. Facilitator:The film, A Simple Goodbye is a graduate film of a prestigious Beijing Film Academy. When the film was entered for our selection at the festival, we viewed it without knowing such an information. We learned about it later and were truly surprised. We were shocked because the level of the quality was certainly higher than that of the Japanese graduate film project. Also, the film is a World Premiere and you have viewed it for the first time in the world. This is certainly a valuable opportunity. Q: Have you also participated in this collaborative graduate film project? Were the other crew students too? Zhao Yanming: First of all, I would like to introduce the director of the film, Degena Yun. She graduated from the Department of Directing at the Graduate school of Beijing Film Academy last year. We were classmates and I was also a graduate of Beijing Film Academy, majoring in Film Production Management and Distribution. Other crew members who majored in our school included art designer, sound recorder and cinematographer. All of them were the students of Beijing Film Academy. So the film production was a collaborative effort of the students. The film was made last year as a graduate project of the director and was completed in the May of 2015. As the theme of the film was about the Mongolians, the art designer and sound recorder were Mongolians. Moreover, the whole crew except for the cinematographer were female. Q: There were Chinese actors from a while ago, from during the Film Studio Era of the Inner Mongolia in the film. I understand that the director came from the family of filmmakers. Zhao Yanming: Let me tell you about the two leading actors and their relationship between the director. Dir. Degena Yun’s father was the head of studio at Inner Mongolian Film Studio. He was a renowned Chinese film director, Sai Fu. Her mother, Mai Lisi was also a famous Mongolian film director. They’ve collaborated as co-directors to create excellent films which focused on the Mongolian themes around the year 2000 and successfully established their own style. Their films were regarded as a special genre by the mainland Chinese as the uniquely Mongolian horse riding actions were involved. The actor and the actress who played the role of the Shan Shan’s father and mother in A Simple Goodbye, Tu Men and Ai Liya are well known in Chinese television and film industry. Tu Men was recently in a popular television drama. Ai Liya is a prominent figure in the Chinese television industry as well. These two veterans made great contribution to this film. Q: Do the Mongolian families place photos of Genghis Khan in their rooms? Zhao Yanming: For us Mongolians, Genghis Khan is a sacred figure and regarded as the ancestor of Mongolian people. So for the traditional Mongolian family, it was usual to worship Genghis Khan by enshrining his photograph in the room, which is similar to the Buddhist worshiping Bodhisattva. This practice of the shrining of photograph is not as popular among the post-80s generation anymore but it was very common among the houses of people who are older than 50 years of age. Q: Can you tell us about the film with horses in the end? Zhao Yanming: The film “Bei Qing Bu Lu Ke” (悲情布鲁克) was filmed in the 90s. But it feels quite a distant for me being a young filmmaker and I am not certain about the details. However, I can generally describe the production process of the film which was special at the time. There were many stunts in the film. Although these can be done by computer generated special-effects nowadays, the technology and budget during the time was very limited, all the dangerous horse riding action and stunts were done by the actors themselves. The performance received the recognition and the film was given The Golden Rooster Award – Best Actor as a group which was very rare for usually it was given to the individual actors. Furthermore, as the film focuses on the ethnic minority (Mongolians), it was an honor to have gained such a high recognition in the country. Q: Is the Dir. Degena Yun’s father’s film studio still actively producing films? Zhao Yanming: In the past, the filmmaking studios were owned by the country in China. Sai Fu was the head of studio of Inner Mongolian Film Studio during the period when the state operated studios were switched to the corporate enterprise. Therefore, the directors from the state operated generations, including Sai Fai, didn’t really consider whether the story or the film would be welcomed by the film market or match the tastes of the audience. Instead, the directors emphasized on its artistic elements. But when the industry was no longer owned by the country, directors needed to consider the entertainment elements and commercial factors, similar to what this film describes. The Inner Mongolian Film Studio was now renamed as Inner Mongolian Film Group. Although the studio were no longer owned by the country, the top managements were still government officials from the Publicity Department. The studio is still making films but the films that are made by the Inner Mongolian Film Group were no longer shown in the mainstream theatres in China because of the vigorous competition among the distributors. There are no art house theaters in China. I believe that these are the big concerns of the film industry since the system restructuring which was made in the year 2000 in China. In addition, the films nowadays are mostly digital films and numerous small private companies are starting to appear gradually, posing the great impact to the existing film industry. The Inner Mongolian Studio is still making cultural films with artistic emphasis such as theaters and coverage on world heritage sites of Mongolia but it doesn’t produce commercial films. Q: As this film was the graduation project of the director, can you tell us what she has in mind for the next film? Zhao Yanming: I spent three years with the director in the graduate school and are good friends. We have talked about many things. It is very difficult for the young film directors to make a living in China nowadays. They may like to pursue the artistic nature in their lives but that will not be suitable for making the living. So they must find a good way to make a living and pursue the artistic nature at the same time. The young Chinese filmmakers are facing the challenge to find the ways to create a film that will best express their own style and idea. I don’t think she doesn’t have a concrete plan for her next film so far because she is busy taking care of her child, which is also the reason why she is not here today with us. Her family matter keeps her busy and there is insufficient time for her to write a new story. But I personally think that she will keep on making genre cinemas and also films focusing on women issues. The reason why she chose this theme as her graduation project was because she was able to create the film together with the Beijing Film Academy’s Youth Film Studio, enabling her to receive the strong support from them. We had classmates who were willing to participate as the crew members, the Studio offered us a great flexibility by supplying us with production equipment and the use of studio facilities. We didn’t have to worry about the business side of the matters. The director herself also treasured this rare opportunity to make the film freely as it may never come across again in the future. Facilitator: We would like you to report the excitement in Japan to Dir. Degena Yun. Zhao Yanming: We are happy to be able to screen our film in Japan. I felt that the Japanese audiences had high level of artistic appreciation. That is why I believe that the needs for the art house films will continue. I will let Degena Yun know all your opinions and impressions. I am sure that she will appreciate it.